Guards on South Western Railways go on strike in a 48 hour walkout from Friday 5th October to Saturday 6th October 2018. 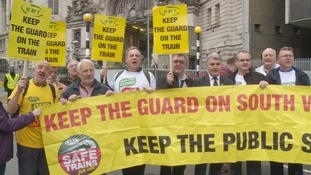 The rail union, the RMT, has announced cleaners on Southeastern will strike in what they call their fight for workplace justice over pay and working conditions. Members are instructed to take strike action by not booking on for any shifts that commence between the hours of 8.30pm on Thursday 19th October 2017 and 8.30pm on Friday 20th October 2017. The dispute is with subcontractor Wettons, who hold the cleaning contract on Southeastern.